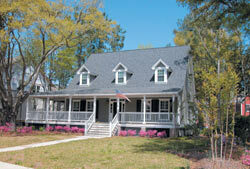 Located in Belle Hall Plantation just minutes from I-526 in Mt. Pleasant, the community of Hibben is a peaceful respite from the stress of daily life. Covering more than 110 acres and overlooking the Wando River, Hibben shares community amenities, including an Olympic-sized pool, tennis courts, playgrounds and a state-of-the-art clubhouse, with the neighboring subdivisions in Belle Hall Plantation. While traditional neighborhood developments are urban in theory, public opinion surveys have indicated that prospective homeowners want more green space. All home sites at Hibben are at least 10 feet wider and 10 feet deeper than lots at other traditionally designed neighborhoods. Conceptualized as a traditional neighborhood design, Hibben's real focus is its authenticity, balanced with affordability. Floor plans, in a variety of period styles, capture the true feeling of small-town Southern charm. While traditional neighborhood design is conducive and appealing to an eclectic, diverse grouping of people, in practice it is very expensive to develop. Most traditional neighborhood developments demand authenticity in every respect, driving up not only construction expenses but also long-term home maintenance costs. Since Hibben appeals to newlyweds, executives, young families with children and empty-nesters looking to downsize, homes vary in size from 1,400 square feet to 4,000 square feet. And with new home construction costs ranging from $150 to $165 a square foot, Hibben offers an affordability that is hard to find in Mt. Pleasant.